Rick Sanchez, the spiky-haired, dimension-hopping mad genius of Adult Swim’s Rick And Morty, drinks. A lot. And, like many chronic drinkers, Rick belches loudly and frequently. This is likely a symptom of a condition called alcoholic gastritis, in which the lining of the stomach becomes painfully inflamed. Belching provides the drinker with limited, temporary relief from this discomfort. Rick’s drinking, if left untreated, could lead to duodenal ulcers and may require medication or even surgery. In the meantime, however, his belches have been lovingly corralled into a playfully disgusting new supercut from Digg. “All The Burps In Rick And Morty” could hardly be more straightforward. This is a minute-long mini-marathon of gas expulsion. Having little regard for the rest of humanity, whom he deems inferior to himself, the scientist has no qualms whatsoever about burping directly into people’s faces as he talks. This includes his justifiably worried grandson and sidekick, Morty. 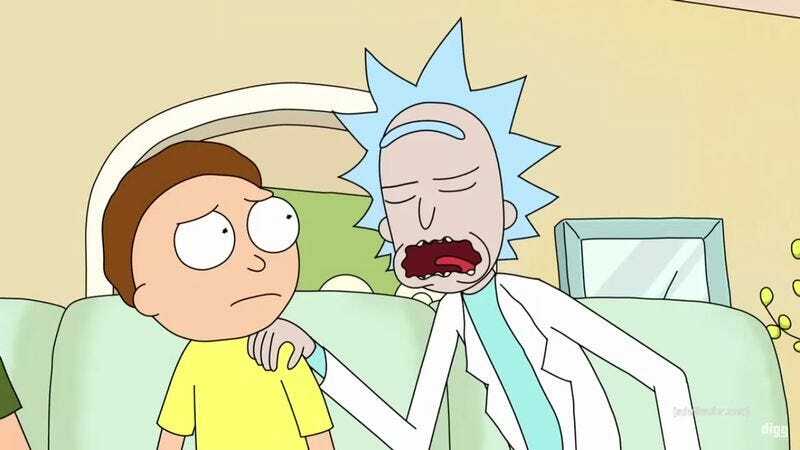 “All The Burps” also gives viewers a chance to ponder Rick And Morty’s curious take on functional alcoholism. As voiced by series co-creater Justin Roiland, Rick is a man who strongly values his own time and hates to pause for anything. Booze may impair his judgment, and one hesitates to think of what it’s doing to his liver, but it does not impede his activities. He doesn’t even stop talking when he feels a belch coming on, leading to Rick’s signature style of “burp-talking.” The supercut, naturally, includes a few examples of this, as when he smugly tells his (alien) gambling buddies, “Read ’em and we-EEEEUUGGGHH-ep!” Mostly, though, the supercut eschews words in favor of pure, undiluted bodily noise. After this, Rick Sanchez may be considered the top chronic burper in all of cartoondom, eclipsing even The Simpsons’ resident boozehound, Barney Gumble. Naturally, Barney’s been honored with a belching supercut of his own. The final judgment remains in the hands of the viewing public.